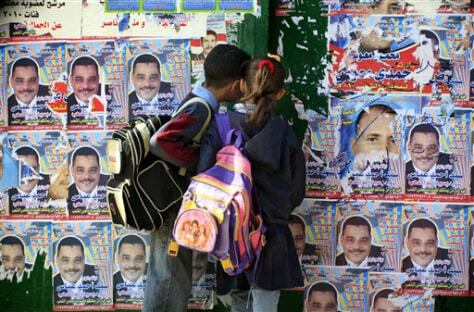 Egyptian students look Thursday at their school gate covered in election posters showing candidates for the coming parliamentary elections in Cairo. Rights activists in Egypt are struggling to ensure they will be able to monitor parliament elections Sunday that they expect to be plagued by rigging. But they are hoping for help from would-be voters themselves through an Internet map tracking violations at the polls.